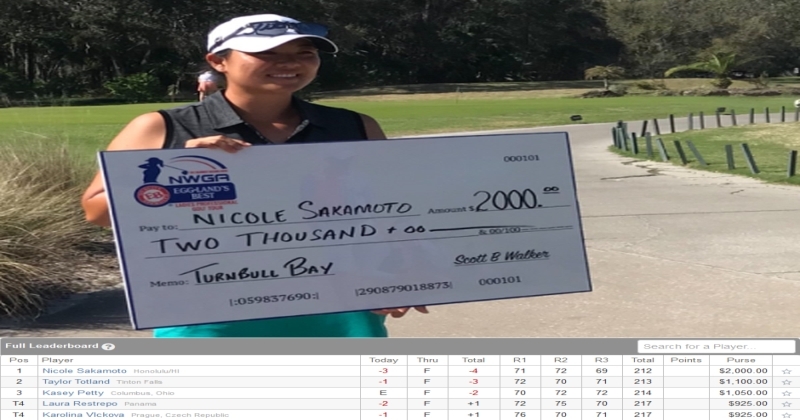 NEW SMYRNA BEACH, Fla. - Nicole Sakamoto from Honolulu, HI, shot 71-72-69 for a 4 under par total of 212 to win on the Suncoast Ladies Tour at The Preserve at Turnbull Bay in New Smyrna Beach, FL. The event took place February 19-21. After two mid round bogies, Nicole found herself trailing by two shots with 8 holes to play. She rallied by birdieing 4 of the final 8 holes to win by one shot. She recieved $2,000 for the victory. This is Nicole's first victory on the Suncoast Ladies Tour. Back in July of 2015 she finished 2nd to an amateur where she was awarded first place prize money but this the week she claimed the first place prize and the lowest score. Nicole has worked for the MLGT since February 2015 while she practices and pursues her dream of playing golf for a living. She barely missed getting her LPGA Tour card last year at Q-School and we're hoping that she has a great rest of 2018 and earns her LPGA Tour card for 2019.